Imbalance settings are now 2 complete independent conditions, each one of them being a Direction (Horizontal-Diagonal) , a Comparison (Ratio, Difference), and a Threshold. 1 or 2 conditions can be used. Imbalance now have a MaxSizeLosingSize and a MinSizeWinningSize, allowing to build a S/R zone on a series of levels that have a very low number of contracts on one side, for instance 5 levels with 0 or 1 contract on the buy side. In that case, use MaxSizeLosingSize=1 . Added IsSellImbalanceOnLow, IsBuyImbalanceOnLow, IsSellImbalanceOnHigh, IsBuyImbalanceOnHigh in the GomOrderFlowValues indicator, available for use in strategies. Added a setting to extend the S/R Zones to the extreme right of the chart. GomOrderFlowPro-Custom-Value will create a custom value based on the formula you define in the settings. For instance, the default setting show the delta %, the formula is Delta/Volume*100. You can even use complex formulas using conditions like in an Excel formula : if(condition, valuetrue, valuefalse). 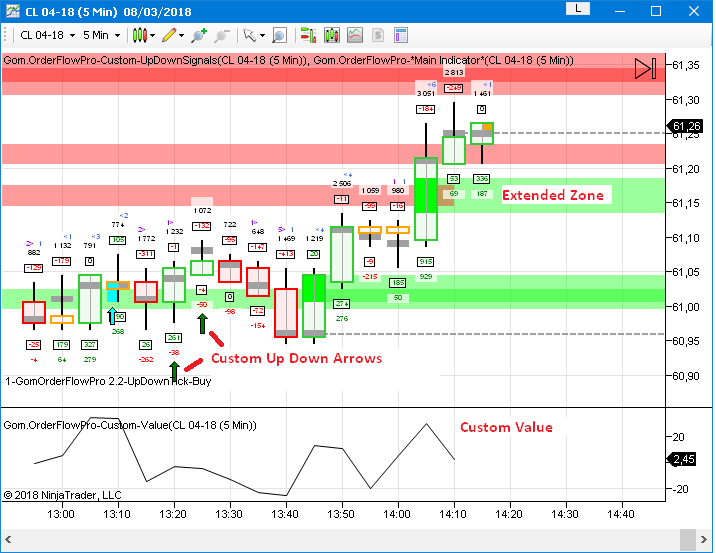 Any value value from GomOrderFlowValues indicator can be used, plus Open,High,Close,Low,Volume. The evaluator builds a custom class with the formulas when it loads and compiles it, so the performance is the same than if it had been coded in a custom indicator.